This is the first in a series of blog posts about transformational adaptation by Garama’s Director, Nick Brooks. The series is inspired by a conference on transformational adaptation and agriculture in East and Southern Africa that Garama organised with the DFID-funded Vuna programme in South Africa in January 2017. It follows a discussion paper on this topic prepared for Vuna by Nick Brooks. Download the pdf of the paper here, and read a related Vuna blog article here. This article was first published on the main Garama website at http://www.garama.co.uk. Deep in the central Sahara, a crumbling mud-brick town sits at the edge of a dry lake bed. This is the medieval town of Germa, in southwestern Libya, one of a string of settlements along the Wadi al-Ajal, a valley defined by the towering dunes of the Ubari Sand Sea to the north, and the black cliffs of the Messak Settafet plateau to the south. Germa is romantic and impressive, but a more interesting settlement lies beneath it. Under medieval Germa, the remains of large stone buildings represent the town of Garama (yes, we stole the name), the ancient capital of the Garamantian Tribal Confederation, a powerful political force in the central Sahara between about 500 BCE and 500 AD that challenged Roman hegemony in inland North Africa, before being incorporated into the periphery of the Roman empire (Mattingly et al. 2003). The mud-brick walls of medieval Germa, built on the ruins of ancient Garama, the capital of the Garamantes, the central Sahara’s first indigenous civilisation. Photo by Nick Brooks. The Garamantes, who made their capital here, are a fascinating study in adaptation to severe climatic and environmental change. Emerging from the cattle herding cultures of the central Sahara, the Garamantes developed urban centres supported by irrigated agriculture and trade, and controlled or influenced a vast area. The first evidence of permanent settlement and farming in the Wadi al-Ajal dates to around 1000 BCE, and is from the vicinity of Germa. What is remarkable about this evidence, and the subsequent development of the Garamantian civilisation, is that it coincides with the final desiccation of this part of the Sahara, when rainfall in the adjacent upland areas effectively ceased and the remaining lakes (in the Wadi al-Ajal and the interdune depressions of the nearby sand seas) dried up. As a result of decades of archaeological work by British and Italian teams (e.g. di Lernia and Manzi 2002; Mattingly et al. 2003), we now have a very clear picture of how the Garamantian civilisation emerged through a long process of adaptation to increasing aridity, and ultimately the effective disappearance of surface water (this happened much later than in most of the rest of the Sahara, which prior to around 3000 BCE was mostly semi-arid savannah, due to the peculiar topography and geology of the Wadi al-Ajal and the adjacent areas). Unable to practice mobile cattle pastoralism in the lowland areas once certain thresholds of aridity were crossed, the inhabitants of this region moved first to transhumance and then to more sedentary cattle husbandry in oasis areas such as the Wadi al-Ajal, complemented by mobile sheep and goat herding in the adjacent highlands. When the surface water finally disappeared, rather than abandon the area or die out, the people who became the Garamantes chased the water underground, tapping the elevated water table under the plateau of the Messak Settafet using underground channels known as foggara, to irrigate the valley floor (Wilson 2006). Cattle engravings in Wadi Mathandoush, an ancient watercourse on the Messak Settafet, south of Germa. Photo by Nick Brooks. The above process took some three millennia, but it was neither smooth nor gradual. Palaeo-environmental and archaeological evidence point to multiple periods of rapid climatic and environmental change, coinciding with shifts in livelihood strategies, population distributions, and landscape use. The links between climatic and cultural change in this part of North Africa, and in the Sahara at large, are well established and uncontroversial (unlike in many other parts of the world, where suggestions that climatic and environmental change have shaped human societies are often treated with suspicion or hostility). 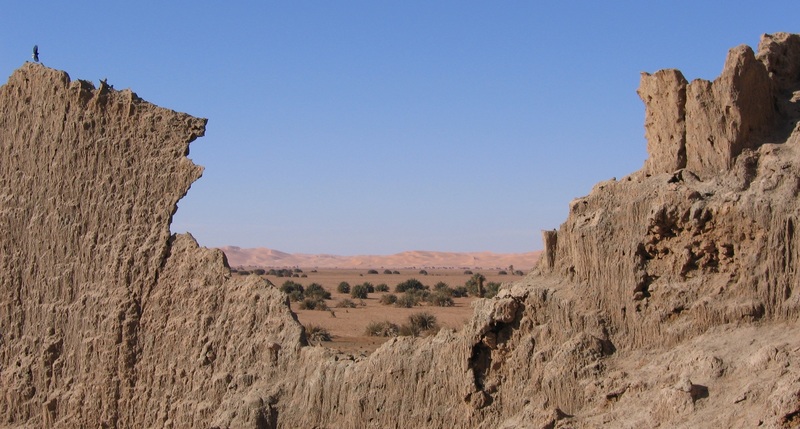 The study of Saharan prehistory is an object lesson in how global climate change can result in profound changes in local environments and the availability and distribution of resources, which in turn precipitate step changes in how people make their livings and organise their societies. This is in contrast to “incremental adaptation” consisting of “actions where the central aim is to maintain the essence and integrity of a system or process at a given site.” Incremental adaptation generally involves the deployment of already familiar measures, perhaps to a greater extent or at a higher intensity than previously, in order to sustain existing systems or practices in the face of intensifying climate hazards, i.e. stresses and shocks such as drought, heavy rainfall or sea-level rise (Kates et al. 2012; Chung Tiam Fook 2015). Put simply, incremental adaptation is about protecting ‘business as usual’ in the face of climate change. Calcium carbonate crust in an interdune depression in the Ubari Sand Sea north of Germa, indicting the presence of a freshwater lake prior to the desiccation of the region some 3-5 millennia ago. Photo by Nick Brooks. In contrast, transformational adaptation occurs when changes in climatic or environmental conditions are so severe, or occur so rapidly, that existing systems and practices cannot be sustained, and need to be replaced by alternatives or addressed through processes such as migration. In the prehistoric central Sahara, transformational adaptation involved first the adoption of mobile cattle pastoralism as the environment became more variable and unpredictable in the 5th millennium BCE, and then its abandonment as the region became hyper-arid after about 3000 BCE and people adopted more sedentary livelihoods or shifted to sheep and goats (di Lernia 2002). A further transformation occurred when the surface water disappeared and the population of the Wadi al-Ajal adopted intensive agriculture linked with the development of a more complex and urban organised society in the first half of the 1st millennium BCE (Mattingly et al. 2003; Drake et al. 2004). Most of today’s adaptation interventions involve incremental rather than transformational approaches (Chung Tiam Fook 2015). Indeed, many do not even go as far as incremental adaptation, instead addressing the so-called ‘adaptation deficit’, or the gap between current practice and what is sustainable under existing conditions (Burton and May 2004). A key question for adaptation in the 21st century is where, and when, the limits to incremental approaches might be encountered, meaning that transformational approaches will be necessary. This might occur as a result of the local manifestations of climate change being so severe and/or rapid that societies simply cannot adapt, or of relatively small changes meaning that systems or activities that are already marginal are no longer viable (Kates et al. 2012). Our prehistoric Saharan analogue suggests one type of change that might require transformational adaptation, namely a transition to hyper-aridity. Such a transition might already be underway in the US Southwest, and is suggested – at least as a possibility – by climate projections for parts of North Africa and the Eastern Mediterranean, and parts of southern Africa. According to the United Nations Statistics Division(1), Tunisia, Israel and Jordan already use 69.7%, 79.7% and 92.4% of their annual total renewable surface water resources every year, through runoff capture and abstraction from non-renewable aquifers. Projected changes in temperature and rainfall mean that total renewable surface water availability may decline below current usage in the latter half of the 21st century. Clearly, current water management regimes and agricultural systems would not work under such a scenario, and different economic and production models would be required in the event of such an eventuality. In southern Africa, climate projections indicate severe drying in the far southwest, while a 2005 study by Thomas et al. raises the possibility of a shift to hyper-aridity in the Greater Kalahari region, as fossil dunes that are currently stable become mobile due to changes in rainfall and wind regimes and the disappearance of vegetation. Such a transition would place the viability of existing agricultural and livestock systems in doubt, potentially requiring a shift to new activities and/or the abandonment of certain areas. Aridity is likely to intensify in many other parts of the world, including parts of southern Europe, Australia and Central Asia. Increases in aridity will be driven as much by changes in temperature and evapotranspiration as by changes in rainfall. However, aridity is not the only impact of higher temperatures. A recent paper by Pal and Eltahir (2015) concluded that the combination of temperature and humidity in the region around the Arabian/Persian Gulf is likely to approach or exceed the limits of human survivability within the 21st century, making it physically impossible for people to live there in the hottest months. The other obvious context in which transformational adaptation might be required is sea-level rise, which will increase disaster risk, potentially to the point at which the costs of defences or reconstruction become unfeasible, leading to the abandonment of coastal areas. Ultimately, sea-level rise will simply wipe out some coastal areas, as they disappear under rising waters. The intrusion of salt water into coastal aquifers due to sea-level rise and subsidence resulting from the abstraction of groundwater will lead to changes in coastal ecosystems and challenge coastal agriculture. A combination of rising temperatures and declining rainfall may make certain crops unviable. A modelling study by Rippke et al. (2016) identified areas in which nine existing sub-Saharan Africa crops, under current management regimes, might become unviable due to climate change, starting in the 2020s for the most at-risk crops. This study suggested replacing existing crops with alternative crops as a ‘transformational adaptation’ measure that was feasible in most (but not all) contexts. The above examples suggest the existence of thresholds of change beyond which existing systems and practices are existentially challenged. Climate vulnerability and risk assessments (VRAs) need to start considering what these thresholds might be, and where and when they might be breached. However, such thresholds are not fixed, and might be ‘pushed back’ by incremental adaptation measures, meaning that transformational adaptation can be delayed or avoided. Modelling studies might also be overly simplistic in their representations of what is viable and what is not, particularly when it comes to agriculture. 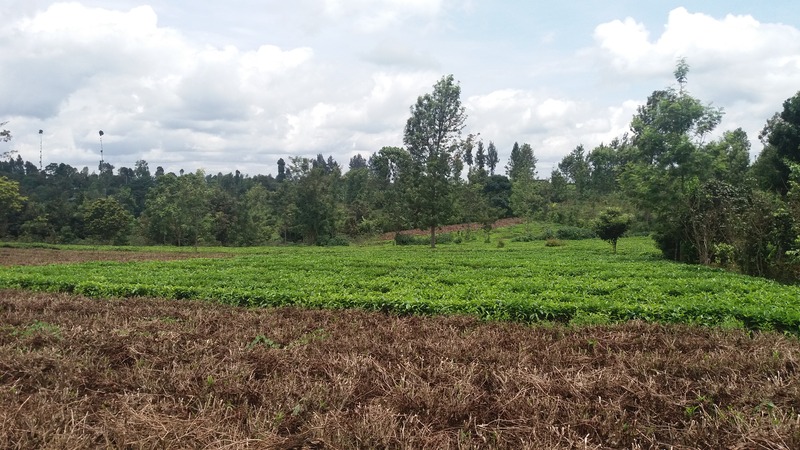 For example, smallholders deploy a host of measures to produce crops in highly marginal environments that might be technically ‘unviable’ by the criteria used in modelling studies. Transformational adaptation as defined above (i.e. abandoning or replacing existing systems on the grounds that they are not viable under climate change) is not a panacea, and should not be proposed as a universal solution. Nonetheless, it should be on the radar of planners and decision-makers, and should be explicitly considered in VRAs and the design of adaptation strategies. Climate projections suggest a warming of around 4°C by the end of the century, relative to the pre-industrial average. This warming is very similar in magnitude to the warming that occurred between the end of the last ice age, some 21,000 years ago, and the beginning of the current interglacial period around 10,000 years ago. But it is happening some hundred times faster. The world of the past 10,000 years has looked very different to that of the last glacial period. It is inconceivable that a similar warming, over a much (indeed, ridiculously) shorter period, will not reshape the face of the Earth in ways that we have only begun to comprehend. Transformational adaptation may not be needed everywhere, but in some places it will be absolutely essential to our survival. Subsequent articles in this series will discuss, among other things, examples of transformational adaptation, the relationship between transformational adaptation and transformational change (e.g. in institutions and governance), the timescales associated with transformational adaptation. Transformational adaptation is one of the many topics covered on our 5-day Adapting to Climate Change training course, held annually in Norwich, UK. Burton, I. and May, E. 2004. The Adaptation Deficit in Water Resource Management. IDS Bulletin 35.3, Climate Change and Development.Chung Tiam Fook, T. 2015. Transformational processes for community-focused adaptation and social change: a synthesis. Climate and Development. DOI: 10.1080/17565529.2015.1086294. di Lernia, S. 2002. Dry climatic events and cultural trajec- tories: Adjusting Middle Holocene pastoral economy of the Libyan Sahara. In F.A. Hassan (Ed. ), Droughts, food and culture: Ecological change and food security in Afri- ca’s Later Prehistory (pp. 225–250). New York, NY: Kluwer. di Lernia, S. and Manzi, G. (eds.) 2002. Sand, Stones and Bones: The Archaeology of Death in the Wadi Tannezzuft Valley (5000–2000 BP). Centro Interuniversitario di Ricerca per le Civilta` e l’Ambiente del Sahara Antico e Delle Zone Aride, Universita` Degli Studi di Roma and Department of Antiquities, Libya, pp. 281–302. Drake, N., Wilson, A., Pelling, R., White, K., Mattingly, D., Black, S., 2004. Water table decline, springline desiccation, and the early development of irrigated agriculture in the Wadi al-Ajal, Libyan Fezzan. Libyan Studies 34, 95–112. IPCC, 2014: Climate Change 2014: Impacts, Adaptation, and Vulnerability. Part B: Regional Aspects. Contribution of Working Group II to the Fifth Assessment Report of the Intergovernmental Panel on Climate Change [Barros, V.R., C.B. Field, D.J. Dokken, M.D. Mastrandrea, K.J. Mach, T.E. Bilir, M. Chatterjee, K.L. Ebi, Y.O. Estrada, R.C. Genova, B. Girma, E.S. Kissel, A.N. Levy, S. MacCracken, P.R. Mastrandrea, and L.L.White (eds.)]. Cambridge. Kates, R. W., Travis, W. R. and Wilbanks, T. J. 2012. Transformational adaptation when incremental adaptations to climate change are insufficient. Proceedings of the National Academy of Sciences 109: 7156-7161. Mattingly, D.J., Reynolds, T., Dore, J. 2003. The Archaeology of Fazzan: vol. 1, Synthesis. Department of Antiquities, Tripoli and Society for Libyan Studies, London, pp. 327–373. Rippke, U., Remirez-Villegas, J., Jarvis, A., Vermeulen, S. J., Parker, L., Mer, F., Diekkrüger, B., Challinor, A. and Howden, M. 2016. Timescales of transformational climate change adaptation in sub-Saharan Africa. Nature Climate Change. DOI: 10.1038/NCLIMATE2947. Thomas, D. S. G., Knight, M. and Wiggs, G. F. S. 2005. Remobilization of southern African desert dune systems by twenty-first century global warming. Nature 435: 1218-1221. Wilson, A.I. 2006. The spread of foggara-based irrigation in the ancient Sahara. In Mattingly, D.J., McLaren, S., Savage, E., al-Fasatwi, Y. and Gadgood, K. (eds. ), The Libyan Desert: Natural Resources and Cultural Heritage, pp 205-16, London: Society for Libyan Studies. This entry was posted in Uncategorized and tagged adaptation, africa, archaeology, climate change, Climate change training courses, climate smart agriculture, CSA, environmental change, existential threat, Garama, garamantes, incremental adaptation, ipcc, lessons from the past, mainstreaming, north africa, sahara, training, transformation, transformational adaptation, vuna on May 9, 2017 by Nick Brooks.